Antique Code Show Ah, the simple pleasures of the earliest computer games - and you don’t get much earlier than 1971. If you’re of a certain age, you’ll almost certainly have played it, whatever make or makes of computer you used back then. 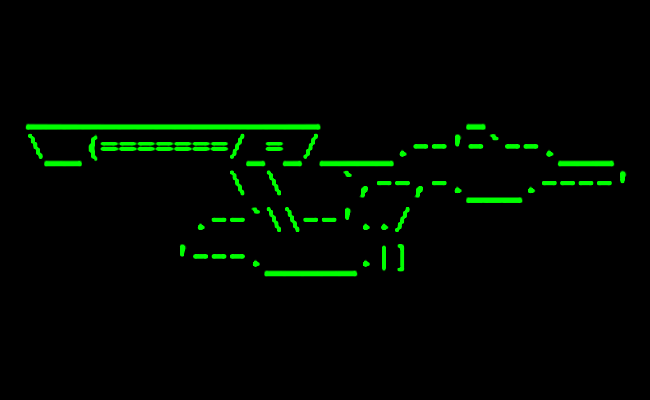 I played it first on a Research Machines 380Z, filling many a school lunchbreak with battles against Klingon warships and the exploration of new star systems, all rendered in Ascii characters. But I also tried at least three versions on my Dragon 32 at home, and I’ve watched pals play the game on their BBC Micros, Sinclair Spectrums, Commodore Vic-20s and even a Texas Instruments TI-99/4A. Star Trek got everywhere. The three versions I had at home were a hand-typed copy of the 380Z listing which I keyed in and converted soon after I got my computer. Later, I tried a version originally produced for the Tandy TRS-80 Color Computer but processed to run on the not-quite-compatible Dragon. Not long after, I briefly had a go at Dragon Trek, published by Salamander Software and - ahem - copied quite illicitly using a dual-tape cassette recorder. There were undoubtedly more versions for the Dragon - I know of at least two more - each ultimately derived from the Basic code written by David H Ahl in 1973, as were the many, many other versions produced for all the other home micros of the period. But Ahl wasn’t the game’s creator. That honour goes to one Mike Mayfield, who wrote it in Basic during the summer months of 1971. It wasn’t the first computer game named after or based on the Star Trek TV series - Ahl would later say he remembered seeing several in the late 1960s - but it was the first of the ‘find and fight Klingons’ strategy type. Mayfield wrote Star Trek on a Scientific Data Systems Sigma 7 mainframe operated by the University of California, Irvine. He was still at school, but he says he managed to acquire a user account anyway, by less than legitimate means. It proved irresistible to everyone who saw it. Around the same time, for instance, he called in on a nearby HP sales office to buy a HP-35 programmable calculator. He got to know the guys there, and at some point told them about the game he’d written on the Sigma 7. They were so keen to have a go themselves, they asked him to port it to their HP 2000 minicomputer. 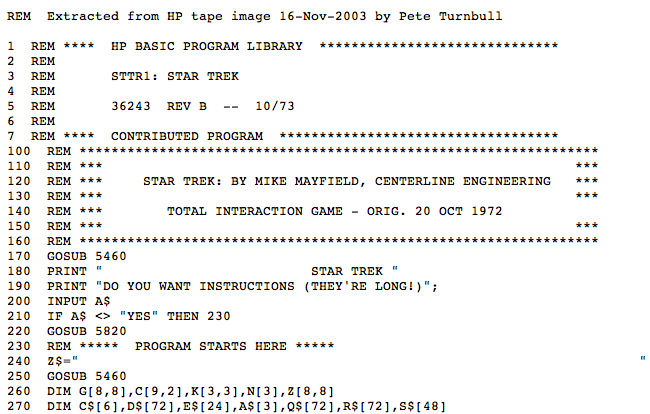 The 18-year-old Mayfield agreed and soon got Star Trek running on its second platform, implemented in HP Basic in October 1972, and published early the following year by HP on tape. HP put the software in the public domain. It was this version that Ahl encountered and was sufficiently enthused with to create a third version, this one in Digital Equipment’s implementation of Basic. He produced the code in the summer of 1973, tweaking it a little in the process. He credits DEC’s Mary Cole as a contributor. He published the listing in the DEC User Society newsletter, and soon users were clamouring for copies so they could run Star Trek on their own machines. Like a virus, the game spread from system to system. Ahl’s Basic version would ultimately lead to Apple Trek, the version Apple itself released commercially for its Apple II microcomputer in 1979. It was written by W Sander, and the name was changed to avoid copyright issues, of course, and that was true of all the other commercial releases. 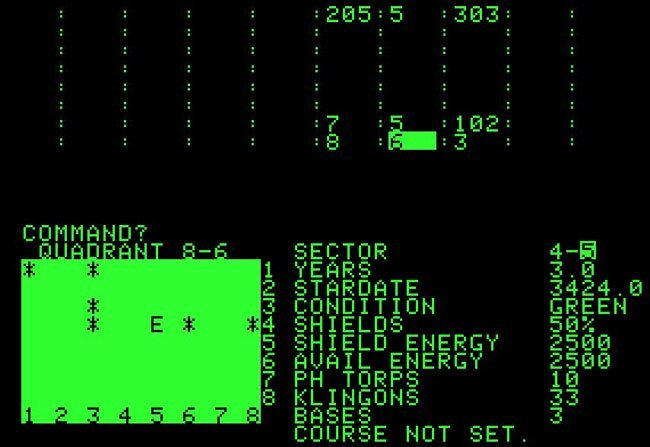 AcornSoft’s release was called Galaxy, for instance; Tandy’s Space Trek. Apple Trek wasn’t the only version published for a late 1970s microcomputer - Star Trek appeared on the Commodore Pet, the Tandy TRS-80 Model I and, as I’ve mentioned the RML 380Z - but the popuarity of the Apple micro and the decision to release the software commercially, undoubtedly means its influence was far reaching. It’s almost certainly this version that led to the appearance of Star Trek on the 8-bit home computers of the early 1980s, particularly over here in the UK. That said, here were no shortage of other releases to inspire programmers to adapt versions from one dialect of Basic to another, or simply to write their own code that played the same way. Indeed, there must be thousands of versions which tweaked the gameplay and which never made it beyond their writer’s computer and perhaps one or two friends’ machines. There were the many versions of the game coders got published in the period’s computer listings magazines.